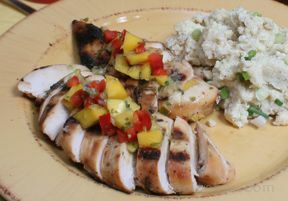 Cantaloupe and mango pair nicely in this easy to prepare salsa that makes a great accompaniment for any type of poultry or fish. 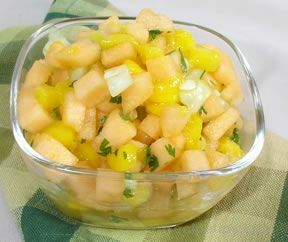 In medium bowl, combine diced cantalope, mango, onion, and cilantro. Whisk together the lime juice, cider vinegar, and olive oil. Drizzle over the fruit; mix until well blended. Cover and refrigerate for at least one hour before serving so that all the ingredients can blend together.